I’ve been a long time in putting this review together, as "The Acceleration of Time" was released by The Luck of Eden Hall way back in April. 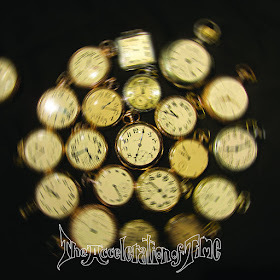 Perhaps it is apropos that a record so obsessed with time should be reviewed only after the reviewer has given this collection of songs the time it so richly deserves. There should be no need to introduce you to The Luck of Eden Hall. After all, they’ve been around for a long, long time (time again), diligently producing album after album of premium grade psychedelic pop. Popping up again and again on those juicy Fruits de Mer compilations, now appearing on soundtracks and in Record Collector magazines. Always solid, always producing much more than mere perfect songs, but solid and well-crafted works of art. If there’s a dud in the cannon, this reviewer sure hasn’t heard it, and I’ve had my eye (and ear) on these cats since Pumpkins were mere sprouts and the Chicago scene was the last unspoiled hunting ground for a music industry that never had a clue. However, if this IS your first foray into the work of The Luck of Eden Hall, you’ve certainly joined the party at a high point. On "The Acceleration of Time", the band goes from strength to strength, serving up their unique brand of psychedelia that features flashes of power pop adrenaline, prog virtuosity and plenty of :Lucy in the Sky..." flower power imagery. The instrumentation is confident and pristine, with not a note out of place. Best of all, LoEH write SONGS. This is no echo drone phoned-in formula psych. Instead you get verses, choruses, hooks, clever turns of phrase and actual sonic stories. This is purpose over Prozac; psychedelia for the thinking man. "The Acceleration of Time" is an ambitious 15 song double album, and it may be the crown jewel in The Luck of Eden Hall's already accomplished recording career. Time is obviously a concern, and a growing one for The Luck of Eden Hall, as the songs on this impressive collection are haunted by the pursuit of the second hand. Throughout the work, clocks tick, bells chime, reminding us again and again that we are being pursued by our own mortality. How many songs do we have left in us? How much time is left on the scoreboard? Kicking off with "Slow and Blown to Kingdom Come", fans will recognize the touchstone elements that make The Luck of Eden Hall sound so unique. Greg Curvey’s multi-headed hydra of guitars that crunch and bite or soar and attack like a psychedelic cobra, drumming by Carlos Mendoza that could hold it’s own against an artillery barrage, Mark Lofgren’s melodic yet precise bass guitar lines that add rhythmic sinew and bone and that amazing melotron washing color onto everything it touches, courtesy of Jim Licka. "A Procession of Marshmallow Soldiers Across the Clockwork Pudding" has to win some sort of award for best song title of the year. This instrumental is the first of several, and serves as a beautiful counterpoint to the clockwork precision of the poppy openers. Although Curvey carries the lion’s share of songwriting credits on this release, Lofgren’s title track "The Acceleration of Time" is a gem, and could be a lost Eno track from "Taking Tiger Mountain by Strategy". His other contributions to this masterwork are equally spectacular, my favorite probably being "Only Robots Can Search the Deep Ocean Floor". One of the best things about this record is how well it works as a front to back concept record. It also works as a collection of greatest hits (if one can do that on a single collection of songs from the same record). Fans of the Shuffle feature will revel at "The Acceleration of Time", as there is no way to mix this up in a way that doesn’t work. Time may move in a linear direction, but the Luck of Eden Hall have fashioned a 77-minute wormhole of a record. Rockers are paced by haunting lullabies, pop gems give way to lush instrumentals and the whole thing is well paced, hypnotic and dreamlike. Sometimes a reviewer gets a record that is love at first sight. And like love that is more passion-based, those glowing Spring feelings may wane with the passing of time. I’m glad that I gave this record such a long gestation period before penning this review. Time itself has served as a proving ground for the intelligence, wit and depth of this sterling effort. Some loves are meant to withstand the test of Time.